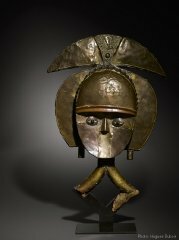 A journey into the magical forests of Gabon to discover a superb selection of ancient reliquaries of the Kota, Obamba, Shamay or Mahongwé peoples. Among the objects on display, you will have the opportunity to see this extraordinary Kota Obamba reliquary figure. The sculpture is thick, powerful and well balanced. The forehead occupies half the volume of the head, accentuating the fine concave face. The almond eyes are fixed with iron nails. The wood has a thick crusty patina. The copper and brass used are of high quality. Note the attention to detail, particularly the pattern produced at the center of the crescent, the embossed hoop encircling the forehead and neat cutting of the central plate of the face.